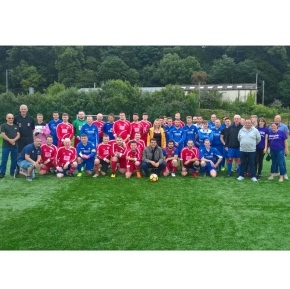 The charity football match took place on Saturday, 21st July in Bangor, North Wales, with Amlwch winning 4-3 to Blaenau. But the real victory was the £864 that the company raised for new company charity partner Scope, which aims to make this country a place where disabled people have the same opportunities as everyone else. Two players were named Man of the Match, Richard Williams, from Amlwch, who is also part of the team taking on the Three Peaks later this year, and Ricky Davies from Blaenau. The match also saw tribute paid to former shift manager, Anthony McNally, with the cup title auctioned off and appropriately named The Anthony McNally Trophy in his memory. This match comes as part of a business-wide fundraising initiative which will conclude in September with the Three Peaks Challenge. REHAU HR Director, Sergio Fonseca, comments: “What a great event we enjoyed at the weekend! The match saw a few ups and downs, including injuries for Callum McMinimee and Aron Wyn Hughes, and we wish them all the best and a speedy recovery. To support REHAU’s fundraising for Scope please visit the website here.